This post was updated on June 5, 2017. My first week on the job at Environmental Defense Fund was also the week the Trump administration released its full federal budget proposal. I joined the EDF+Business team after working at the U.S. Department of Energy (DOE), implementing technology-to-market innovation partnerships for the Office of Energy Efficiency and Renewable Energy (EERE). The proposal slashes EERE and related offices and programs that have been at the forefront of successful public-private partnerships. At a time when the U.S. is backing out of the Paris Climate Agreement and federal clean energy technology investments are critically and urgently needed, this budget threatens American innovation. Funding that nurtures new businesses without requiring their owners to give up any stake in their companies can be make-or-break for the early-stage startups that drive innovation. When government, well-positioned to make this kind of unique investment, puts forth tax-payer dollars, it encourages the private sector to buy-in as well—oftentimes with a multiplying effect. DOE has created opportunities like these that reduce risks for both entrepreneurs and investors. It is through this public-private collaboration that meaningful partnerships and lasting progress are possible for clean energy and our nation’s economy. 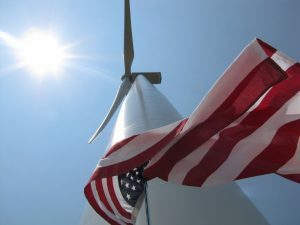 Titled “A New Foundation for American Greatness,” the president’s budget proposal jeopardizes nearly a decade of progress in building our clean energy economy. Dulling the cutting edge of our nation’s innovation enterprise curtails our ability to strategically lead in scientific and technological innovations more broadly, across sectors. Decelerating cleantech research, development, demonstration, and deployment would also inhibit our ability to deal responsibly with climate change and its consequences. Specifically, the President’s plan cuts FY18 funding to EERE by over $1.4 billion, down nearly 70 percent from FY16 and FY17 levels, and it all but eliminates the $290 million Advanced Research Projects Agency-Energy (ARPA-E), with a 93 percent reduction for FY18. It zeroes out EERE’s Strategic Programs Office that initiated, funds, and organizes tech-to-market efforts like the National Incubator Initiative for Clean Energy, Small Business Vouchers Pilot, and Energy I-Corps, which build innovative partnerships among startups, small businesses, incubators, and accelerators and give them unprecedented access to national lab scientists, engineers, and equipment. The plan does note that strategic subprograms would be consolidated or transferred to elsewhere within DOE. The budget also includes 70 percent cuts to both EERE’s Solar and Vehicle Technologies Offices. These are home to successful public-private partnership programs like the SunShot Initiative, which helped the solar industry achieve DOE’s vision of $1-per-watt three years early, and SuperTruck II, which builds upon the success of the original SuperTruck program that showed 115 percent improvements to freight fuel efficiency are possible. The reductions go as far as eliminating the Weatherization and Intergovernmental Programs Office, which has worked with state, local, and tribal governments for decades to assist more than 7 million low-income households find significant savings through energy efficiency. These upgrades have lowered these families’ utility bills an average of $283 per year and brought demonstrated improvements to health and safety. There is something for everyone to be concerned about in this proposed budget, and even the fossil fuel industry stands to lose. Even DOE “crown jewels” that Energy Secretary Rick Perry vowed to protect are not safe as the National Renewable Energy Lab (NREL) now faces a 20 percent cut. NREL celebrates its 40th anniversary this year with its 2,200 employees who hold over 300 patents and further support the growing clean energy economy through more than 500 technology partnership agreements with businesses, nonprofits, and academic institutions. Despite these and other successes, the proposed budget significantly defunds or eliminates clean energy activities across all 17 national labs. The contradictions between the administration’s rhetoric and numeric reality are signs that our Energy Department may very well lose its unique and leading role at home and abroad in driving innovation. There is something for everyone to be concerned about in this proposed budget, and even the fossil fuel industry stands to lose from cuts to ARPA-E and EERE, which also work on methane leak detection and advanced combustion engines. These offices, programs, and labs have proven results, and to end or scale them back would be a disservice to U.S. industrial competitiveness and the American people. The good news is that clean energy continues to receive bipartisan support, and the proposed DOE cuts are widely opposed, including by at least six Republican senators. There is also broad consumer backing even among Trump voters for Energy Star, a joint EPA-DOE program helping consumers identify and select energy-saving products. Yet it too has been targeted by the administration. Fortunately, the private sector continues to step up, with diverse businesses and investors making serious cleantech commitments around the globe. As I begin my work at EDF during these challenging times, I find hope in the common goal of human prosperity shared by the public and private sectors, in the opportunities created by collaborative approaches, and in the vast infrastructure and resilient spirit that are the true foundations of American entrepreneurship and innovation. Our country has a history of unexpected, rapid, and game-changing breakthroughs in science, technology, health, and sustainability that have improved the lives of millions of people. These can continue and accelerate into the future if, and only if, we do not back down now. This entry was posted in Clean Energy, Climate, Energy Efficiency, Energy Innovation, Renewable Energy. Bookmark the permalink. Both comments and trackbacks are currently closed.